Throughout history, rich and poor countries alike have been lending, borrowing, crashing--and recovering--their way through an extraordinary range of financial crises. Each time, the experts have chimed, "this time is different"--claiming that the old rules of valuation no longer apply and that the new situation bears little similarity to past disasters. This book proves that premise wrong. Covering sixty-six countries across five continents, This Time Is Different presents a comprehensive look at the varieties of financial crises, and guides us through eight astonishing centuries of government defaults, banking panics, and inflationary spikes--from medieval currency debasements to today's subprime catastrophe. 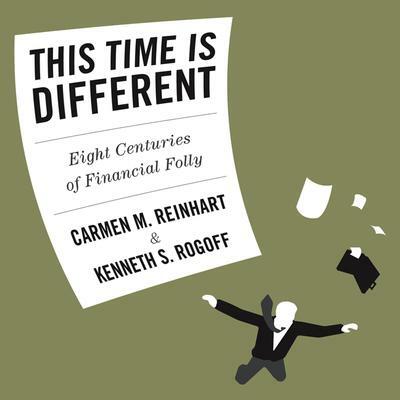 Carmen Reinhart and Kenneth Rogoff, leading economists whose work has been influential in the policy debate concerning the current financial crisis, provocatively argue that financial combustions are universal rites of passage for emerging and established market nations. The authors draw important lessons from history to show us how much--or how little--we have learned. Using clear, sharp analysis and comprehensive data, Reinhart and Rogoff document that financial fallouts occur in clusters and strike with surprisingly consistent frequency, duration, and ferocity. They examine the patterns of currency crashes, high and hyperinflation, and government defaults on international and domestic debts--as well as the cycles in housing and equity prices, capital flows, unemployment, and government revenues around these crises. While countries do weather their financial storms, Reinhart and Rogoff prove that short memories make it all too easy for crises to recur. This Time Is Different exposes centuries of financial missteps.